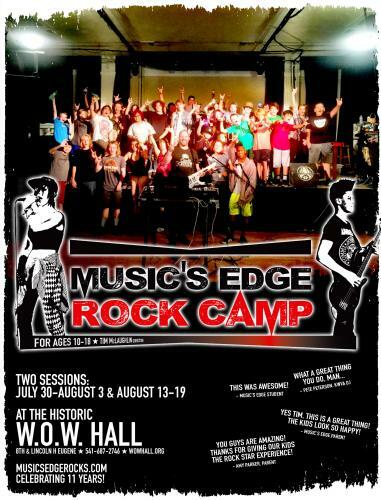 Registration is now open for the Music's Edge 2018 Summer Rock Camp at the WOW Hall. Director Tim McLaughlin will host two different weeklong camps: July 30-August 3 and August 13-17. The program is designed for ages 10-18. Music's Edge began as a unique music program that was created by Tim McLaughlin in 2004. This will be the WOW Hall's tenth year hosting the very successful rock camp. Each session goes full-steam all week and ends with a full-blown, rockin' show, with all the lights and sound that would make any rock star proud. The two “gigs” will be Friday, August 3, and Friday, August 17. Each camp will also have a second show; the first will be at the Saturday Market on August 4 (3:30-5:00 pm). BlairAlly Outdoor stage is the show for the 2nd session. 3:00 - 6:00 pm. To register, please call the WOW Hall at 541-687-2746 between noon and 6:00 pm,. Monday through Friday.